Preventing Medical Errors in Nutrition & Dietetics is a 2-hour online continuing education (CE/CEU) course that addresses the impact of medical errors on today’s healthcare with a focus on root cause analysis, error reduction and prevention, and patient safety in the practice of nutrition and dietetics. Real life stories, ethical considerations, health literacy and growing health consumerism are addressed. Also included are tips for distinguishing scientific from pseudoscientific treatment claims and for improving communication with patients. Printable hand-outs, a glossary, and online resources are provided. 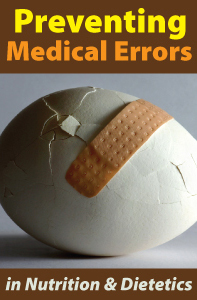 This course satisfies the requirements of the Florida State Legislature mandating a 2-hour course relating to the prevention of medical errors as part of the licensure and renewal process for health professionals. Susan Mitchell, PhD, RDN, LDN, FAND, is a nutrition consultant in digital and traditional media and communicates evidence-based health messages thru social media, radio, TV, video, and print. She also provides continuing education for health professionals through speaking, webinars and written articles/courses. Along with Dr. Christie, Dr. Mitchell is co-author of three books, Fat is Not Your Fate, I’d Kill for a Cookie, and Eat to Stay Young and is a contributing author to Macmillan Reference USA's Nutrition and Well-Being A to Z. A Registered Dietitian Nutritionist, Fellow of the Academy of Nutrition and Dietetics, and Distinguished Florida Dietitian, Dr. Mitchell earned her Ph.D. from the University of Tennessee and taught nutrition and health science at the University of Central Florida for over 8 years. She serves on the University of North Florida’s Department of Nutrition & Dietetics Advisory Committee and the advisory board of Family Circle magazine. Drs. 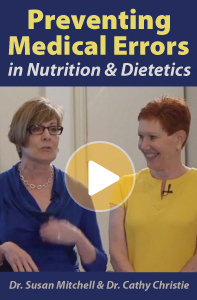 Christie and Mitchell have taught the Preventing Medical Errors in Dietetics Practice 2-hour course for over six years at the annual Florida Academy of Nutrition and Dietetics meeting. Financial: Receives a commission on sales of this course from Professional Development Resources, Inc.